This book does something new for its reader. It brings to life—with real world examples drawn from rich engagement with new and seasoned teachers—how to think of one's self on a trajectory of powerful practices that unite instruction and assessment. The idea of developmental approaches to student learning is not new, but the authors have seized on something with their new framing of the literature, what they provisionally call teacher learning progressions in formative assessment practice. This is not the place to explore the merits of such an approach. Instead, we need to make room for new voices and a new vision that the next generation of scholar-practitioners has brought to the table. This work invites us into a fresh conversation. For those of us with long memories and the willingness to look across our respective ponds, the debates about the true meaning of assessment have raged for decades in the United States, Australia, and, of course, England. We all have had different ways to communicate what assessment means—to different audiences, in different times and settings. Bob Stake (1976) has said that when a cook tastes the soup to make just-in-time improvements, it is formative. But, when a guest sits down to taste the soup and evaluate the "final product," it is summative. Formative evaluation occurs during the learning, summative at the end of the marking period. Both are important to schools, teachers, and students. Surely the point of tasting the soup, while the cook and staff are gathering feedback about its progress, is to maximize the chances that when the guests taste the dish, it will be an excellent result—from multiple perspectives. Viewed this way, the process of formative feedback leads us to optimal summative achievements. Both purposes of assessment matter, but in different ways. Today's evaluation theorists make the distinction between formative and summative very clear, as did Michael Scriven (1967) when he invented the terms 50 years ago. He claimed the difference between formative and summative was related to the purposes, goals, timing, and how information is used in a system or organization. Formative was more to improve and guide stakeholders; summative to provide a set of claims about what has happened, that is, what value we can attach to the target performance or outcome. Soon after Scriven wrote his work, Bloom "borrowed" several ideas about the role of evaluation in educational settings. The term formative and summative assessments (Bloom et al., 1971) were coined. This move was unfortunate in that it set up a language game we now play, labeling some test instruments formative, others interim, and still others summative. The ostensible type of the instrument—not the purpose, use, timing, and information uses of any instrument—became the decisive factor in our evaluation and assessment discourse. Educational assessment experts never gave Scriven sufficient credit for the invention of the terms and his specific approach to making judgments. Instead, we were left with boxes, categories, and labels for tests—with many unfounded claims about the power of the "summative" test instrument and little evidence for the efficacy of the uses of any particular tool. For too many students in primary and secondary schools today, assessment has become synonymous with numbers and grades. The principals, school districts, or government officials make a set of summative claims about what students know and can do. They put up charts, color codes, and mark the students' work as done. Summative assessment has become a powerful signal: learning is over; the grade or number is your "feedback" and it's now time to see how you stack up against another. Duckor and Holmberg reverse these claims about "formative" versus "summative" assessment by providing a lens that relies much more on the nature, timing, and use of assessment information during the lessons; much more on the interpretations by students and teachers of so-called "soft data" generated with attention to speaking and listening; much more reliance on understanding the staccato and cycle of learning, where the students are right now and the possibilities for moving them forward. But the authors do something more: no longer are we stuck in debates about the meaning of the objects—the tests, the quizzes, the homework—in assessment and evaluation. Rather, we can move toward the challenges and opportunities of using all sources of data. In this book, classroom data are generated by subjects (persons) for subjects (other persons) to learn from and interact with during instruction. Rather than focus on assessment, which signals a stand-alone event or an alpha-numeric ranking, the authors rightly emphasize the process of assessing. Their new language of moves and tangible practices refocus the field toward pedagogical action in the classroom. 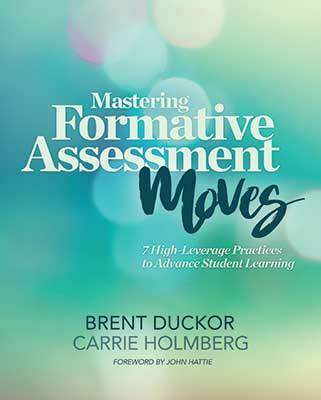 In the Introduction, Duckor and Holmberg ask: So, why another book on formative assessment and evaluation—and why now? Hasn't it all been said before? Everyone knows that formative assessment and evaluation in the classroom make a difference in students' lives and produce better outcomes, right? My provisional reply: Yeah right, so why is there still an overemphasis on summative testing; an overemphasis on providing scores and numbers; an overemphasis on commercial companies pouring out "mile-wide, inch-deep" tests used for accountability purposes to see if teachers are doing their jobs? Why have teachers not been provided with tests aligned with the curricula and their immediate teaching needs that measure growth? For decades, the research community has known that formative evaluation and assessment stand at the center of effective instruction. My own work (Hattie, 2012), as well as many others' work, reminds us that assessing during learning makes a real difference in student outcomes. Powerful, tangible results come from teachers who are assessing and reassessing student learning—minute by minute, hour by hour, day by day. But it is the quality of information from this assessing "for learning" that is the focus of this book. We need to move away from defending the use of formative evaluation in terms of it being better than summative, and, instead, ask how to implement formative thinking to thence maximize the summative impact on students. This means, as this book ably demonstrates, striving for a deeper understanding of instructional decision making, ways of thinking and reflecting before the whole class, and powers of listening well and demonstrating to students that you have listened before offering feedback. The authors further remind us: formative thinking means developing an expansive and flexible repertoire of speaking, listening—and therefore, thinking—skills on behalf of teachers for students. During my years working in New Zealand I led a team to develop the national assessment scheme for elementary and high schools (e-asTTle). It was based on providing teachers, students, parents, and school leaders with up-to-date information and interpretations about where students were going, how they were going, and where they were going next. The emphasis was on providing assessment information back to teachers about their impact (especially over time)–who had they impacted? About what? And to what magnitude? Our approach to assessment was as much about generating feedback to teachers about their impact as it was for students to gauge growth. Our goal in these systems was to allow formative evaluation and assessment information to provide feedback to teachers about their progress with their students' and their own development. The primary function of classroom assessment must be to support learning by generating feedback that students can act upon in terms of where they are going, how they are going, and where they might go next. This involves, necessarily, that students participate in the assessment of their own learning—and that they learn to recognize and understand main ideas and to apply new learning in different ways and situations. The core notion is that students who have developed their assessment capabilities are able and motivated to access, interpret, and use information from quality assessments in ways that affirm or further their learning. One of the central questions addressed by this book is how to support teachers who are developing classroom assessment approaches that reveal rather than obscure these feedback loops (Sadler, 1989). By reframing the formative assessment and evaluation literature as high-leverage, interlocking, and real-time instructional moves that yield assessment information for teachers and students, Duckor and Holmberg have reminded us of the interconnection between good teaching and good assessment practice. Rather than merely expect that teachers transmit knowledge to students about their status or standing, the authors invite us to see how various classroom-based assessment moves can, in fact, maximize information exchange and flow. Like cooking or dancing or orchestrating "live action," theirs is a lively, enriching, and optimizing approach to the formative purposes and practices in classroom assessment. The theme throughout this book is on the depth and use of pedagogical knowledge by teachers; the shift from spotlighting their talking to honing their skills in active and informed listening; the focus on ensuring students understand their feedback; and the critical nature of the moment-by-moment decision making about the learning. Developing this depth and these capacities—and using them well to advance student learning—is, as they testify, not easily done. Teacher progression in these areas takes commitment, effort, time, and support. Duckor and Holmberg's work has implications for teacher development. That is clear. Their work, however, could also influence changes needed in how observations of teachers could help them progress in their practices. Observations of teachers have tended to lead to recommendations about how to change how they teach or what teachers should do. It is much harder to "see" the decision making, the judgments that teachers are making unless we focus on observing the impact of the teacher on the students. Quite a mind shift. Duckor and Holmberg offer language and ideas—a conceptual framework, the seven moves—for classroom practice that can help make what's hard to see more "seeable" and more discussable. Groups of teachers being able to discuss their practices together through the lens of the moves may be the most powerful impact this book will have. These formative assessment (FA) moves highlight the importance of teacher listening, seeing learning through the eyes of students, and checking to see whether their feedback has been understood by the students. It is not sufficient to merely give formative feedback, but to check whether the feedback has been understood, and is therefore usable by the student. These are strong messages for teachers who wish to pose questions more strategically, to reduce their talk time, and to use visible pausing and listening procedures, while inviting students to "think aloud" about their current understanding. The authors also remind us that we must first create high levels of trust so that students can say "I do not know" and seek formative feedback from one another and their teachers. In this moves-based framework, there is a relentless checking for understanding—minute by minute—by probing to see what the student understands and does not yet understand. There is focus on interpreting, categorizing, and evaluating the students' learning experience (they call this "binning") so that valid and reliable instructional decisions are more likely. Duckor and Holmberg remind themselves as teacher educators on this journey as much as us the readers: the power of formative is very much in the "not yet." We all have a role to play to make this happen. The message that also weaves through this book is on the depth of pedagogical knowledge by the teachers, the move from the talker to the listener, the focus on ensuring students understand the teacher's feedback, and the critical nature of the moment-by-moment decision making about the learning. Working for over a decade with novice teachers, Duckor and Holmberg have earned their knowledge of formative evaluation and assessment "in the lab," so to speak, of preservice credential programs. They find teachers are individuals, working within the norms and code of particular subject disciplines, each struggling to make a move in the mathematics, art, physical education, world language, history, science, English, or the music classroom. As they share the stories of teacher candidates, we see how much harder it is to prime, pose, pause, probe, bounce, tag, and bin than we first thought. It turns out these seven high-leverage practices require a deep respect for the student teacher, what they bring to the university class and clinical placement, how they think and react, their motivations and how to enhance these, and their understanding of what it means to learn to become a formative assessor. The FA moves framework requires building trust not only between the teacher and the students but among students for them to seek help, expose their misunderstanding, and explore together how to improve. These moves invite teachers to move beyond surface content knowledge to enabling students to make connections and explore the joy and creativity of forming new relations between seemingly unrelated ideas. These moves require the development of so-called expert teachers who are reflective, enthusiastic, passionate, and knowledgeable about the content and understanding of the lesson. These seasoned teachers and those they mentor into the profession need to care to make the difference, preferably caring about their subject matter, and caring about all their students' achievements. For those who study and advise teachers, classrooms, and schools, the seven moves are powerful reminders of the expertise required to invoke formative evaluation during the lesson. It is so much easier for educators to keep talking, to pathologize the students as having problems (because of their post-code, their lack of prior knowledge, their deficit motivation, their lack of attention), and to say "I taught but they did not learn." It is so much easier to announce "Wait, in eight weeks I will give you a test and you can see if you learned anything from this course!" It is so much easier to talk in generalities and "do nows" about formative assessment as if one could separate practice from theory. Duckor and Holmberg ask us to pause, giving us a new grammar of practice and robust theoretical framework, connecting instruction with real-time, embedded assessment. Years ago, Dylan Wiliam and Paul Black (1996) advised us not to use the terms formative and summative assessment, as their experience in the United Kingdom was that these terms were too easily misused. Governments started adopting these labels for almost everything they do in hope of providing a cloak of respectability to any measure they advanced! Educational systems and policy makers were also apt to misuse both terms, and justify their "data driven" policies without careful consideration of either the formative or summative claims advanced on behalf of their "metrics." In an age obsessed with "big data" and quick solutions, Duckor and Holmberg have given us a rare treat by placing the assessment emphasis back on the work of teachers and students, who are teaching and learning together in a community, and making sense of the assessment information that may be formative or summative depending on its use. More exciting, they have moved the field forward with their focus on the seven ways of thinking and doing FA and they have presented a rich tapestry of ideas and strategies to maximize the power of formative evaluation in today's classroom. Enjoy.